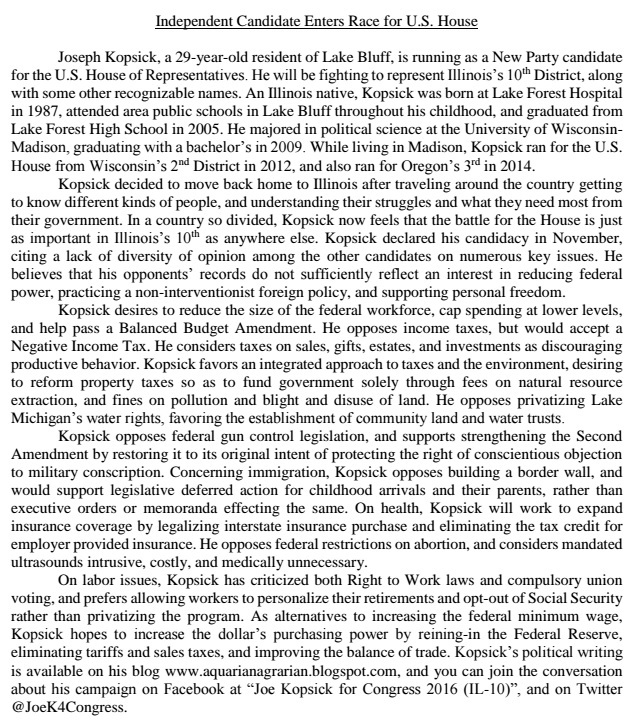 A press release that was sent out says Joe Kopsick will need some 10,000 petition signatures (as of June 27) to be on the ballot in November. For the record, more than 150,000 votes were cast in the March Primary for 10th District candidates. None of these voters will be eligible to sign a nominating petition for Kopsick. Your LakeCountyEye hazards to guess that the Kopsick campaign may have their work cut out for them. Especially considering that Kopsick is running under the banner of the Absurdist Party. Note to Ops: If you are running a 3rd party insurgency campaign and you need 10,000 signatures on short notice, it may behoove you to give your new party a sensible name ... like the Sensible Party, maybe. Just sayin'!